If you would like to know more about other available Voice Assistants please visit 1Home Voice. For different gateways visit Supported Gateways. What does 1Home Voice Control do? as well as any KNX IP interface. How can I start with Voice Control? That’s it! Now you’re ready to start using Voice Control. Can I, as a less technical user, do the setup myself? Of course! 1Home is simple to use and fast to set-up. Setting it up is as simple as copying text from your Smart Home mobile app to our 1Home App and clicking Save. 1Home takes care of the rest. What do I need to use 1Home? 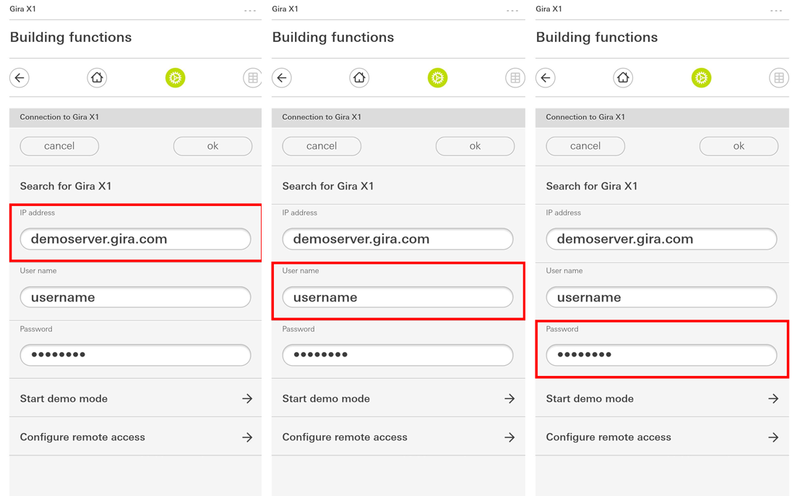 You need a configured Gira X1 server prepared for remote use via Gira X1 mobile app. This configuration is usually done by a professional installer using the Gira GPA software. If you do not have the remote mobile app configured, please contact your installer. How do I connect 1Home to my Gira X1 Server (Gira X1)? Hostname or external static IP: Please enter the external address of your Gira X1. Example: mustermann.giradns.com. Please do not enter internal network IP addresses like 192.168.X.X, 172.X.X.X, or 10.X.X.X. Also please do not enter the http:// as part of the address and note that you need to enter the port number in a separate field. External static IP and other DNS address are also supported. Port: Please enter the port of your Gira X1. The internal Gira port needs to be forwarded to your router. Default: ‘4432’. See instructions on how to configure port forwarding later in the document. Username: Please enter the username for your Gira X1. Password: Please enter the password for your Gira X1. If you do not remember the password please check with your installer. Press "Save" button and if the connection details are correct, 1Home should recognise all your devices in your smart home. Click on the Devices tab at the top of the page to access a list of all detected devices. If you have issues connecting 1Home to your Gira X1, please contact our friendly support team at support@1home.io or via the blue Chat bubble in the bottom right corner. If you would like to use Voice Control without Port Forwarding, please read more about the 1Home Box product. I don't want to use port forwarding. What other options do I have? Please take a look at our 1Home Box device, which eliminates the need for Port Forwarding, dynamic DNS or externally accessible IP. The 1Home Box device enables Remote Access, HomeKit support, IoT Orchestration and faster voice control. The device is simple to use and requires no technical knowledge, simply connect power & network and the device is ready to go. Which Gira X1 devices can be controlled through voice using 1Home? 1Home detects all X1 function templates available through your mobile app which make sense for voice control - lights, switches, scenes, blinds and thermostats. You can find a complete list of all supported commands in the Voice Control FAQ. Why I cannot find some devices which are available through the Mobile app? Some functions like status display or set value functions do not make sense for a voice interface and therefore are not available in the 1Home interface. If you still feel a function would make sense and should be available over voice interface please send a message to our support team at support@1home.io. I would like to add a new function to control with voice. How can I do this? We suggest contacting your installer to add new functions to your Loxone Miniserver configuration. After the installer adds new devices, please visit the 1Home dashboard at https://my.1home.io/ and press Save again. New devices will be detected and merged with already configured devices. Do not forget to discover new devices on your Smart Assistant when finished with device configuration. Users of Amazon Alexa only need to say “Alexa, discover devices”. Google Home & Siri HomeKit users should go to the 1Home App and open the Devices tab. In the sidebar on the left there are two buttons: “Sync devices with Google” & “Sync devices with HomeKit”. To discover new devices click the button. Find out more about 1Home Voice Control on our website. Please let us know at support@1home.io or by contacting our helpful support team via Chat (blue button in the bottom right) or book a support call.